Home LIFE & STYLE	Fighting Fit: It’s time to duel! Fighting Fit: It’s time to duel! In my last article, I extolled the virtues of martial arts practice as a complete form of exercise that addresses all aspects of physical conditioning. I was subsequently bombarded by a gaggle of SportSci students insisting that combat isn’t a weight-bearing exercise. To thee I say nay, for if thou wishest to strength train, try to swing yon hunk of steel for ninety minutes. 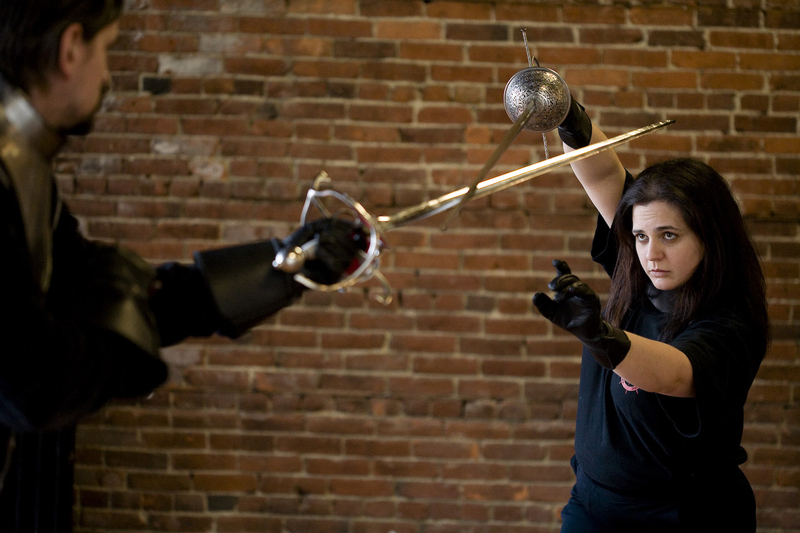 Enter Academie Duello, your one-stop shop for Renaissance combat training—and I do mean shop. The first thing you will notice when you walk in the door are the walls of merchandise: practice weapons, armour, and books on swordplay. Make no mistake, Duello is a franchise. See also the method of payment; once you complete the introductory Warrior Fundamentals course, you must pay monthly tuition to practice a set number of hours per week, and then choose which classes fill that time. The basic fee, $139 a month, only nets you two hours a week. That isn’t much if you want to learn quickly or just enjoy the classes, so you can’t practice much unless you pay $219 a month for unlimited access. That’s not even including the $75 membership that entitles you to pay tuition in the first place, the $99 intro courses and $100-an-hour personal lessons. Students can save $20 a month—provided you sign on to a 12-month contract. So far as finances, crack is cheaper by a wide margin and they really, really want you to buy your own set of custom armour. Some would shut the book there, but at least the rates and times are flexible. The instructors are also credible and active in the theatre community, often choreographing fights for Bard on the Beach. They regularly host a stage combat certification course, so if you’re an actor, your resumé might benefit from training at Duello. Due to its commercial nature, I’d have trouble recommending Duello if not for its professional reputation, enthusiastic instructors, sterling safety, and the plethora of weapons to learn. They’ve got everything; poleaxes, longswords, rapiers, bows, even a Bartitsu cane-fighting course for the esoteric fighter who wants to fight like Sherlock Holmes. In truth, Duello’s greatest virtue is its variety. Aside from the training courses, there are callisthenics-focussed conditioning sessions that add fun twists to your typical workout routine—hurling medicine balls at one another’s kite shields, for instance. There’s also a five-day Knight Camp program for the kids, so if you’ve got any children or siblings who are interested in medieval history, they might enjoy spending some time practicing the knightly virtues—sans steel, of course. In summary, the only thing Duellois better at than swordplay is making money off a brand. Are they quacks? Hardly. The experience is an enjoyable one; it just may not be affordable for the average college student who’s already struggling to pay tuition. That said, the training is of good quality, so if it’s within your means, drop by 415 West Hastings Street.